Securely mount your monitor to a desk with the black Chief Kontour K1C Dynamic Column Mount. This device supports landscape and portrait viewing, and features Centris Extreme Tilt technology for flexible viewing. The height can also be adjusted to accommodate your viewing environment. This mount arm features a desk clamp design, and includes mounting hardware for easy installation. The Kontour K1C is compatible with displays that incorporate 75 x 75mm and 100mm x 100mm mounting patterns, and with a weight up to 22 lb.The black iPad 2nd, 3rd & 4th Generation Interface Bracket - VESA 100 x 100 is designed to allow you to attach your 2nd, 3rd or 4th Generation iPad to select Chief wall, desk and pole mounts. 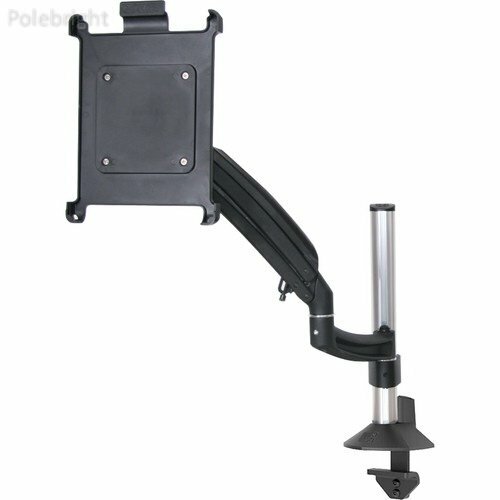 It attaches to any VESA 100 x 100 mm compatible mount, and securely holds your tablet while in use. And when you want to take your iPad on the road, no worries; the bracket can easily be removed without the use of tools. Features include custom-molded materials, a minimalist design, and durable functionality. If you have any questions about this product by Polebright, contact us by completing and submitting the form below. If you are looking for a specif part number, please include it with your message.